Via ESPN – IRVING, Texas — The Dallas Cowboys remain hopeful Tony Romo will be able to play Sunday against the Jacksonville Jaguars in London after not playing against the Arizona Cardinals. 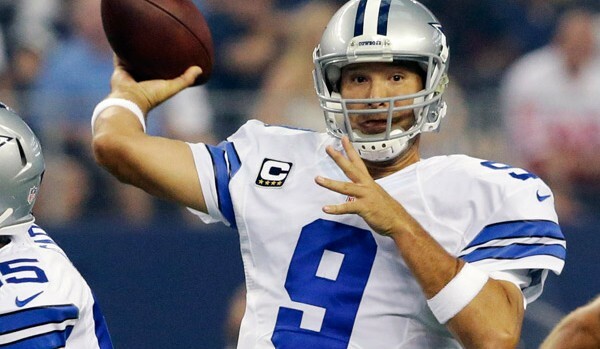 Romo suffered two transverse process fractures in his back on Oct. 27 against the Washington Redskins. He will make the trip to London tonight, but he has not practiced on a Wednesday since Week 2, so he could continue to follow the same schedule. He did not practice last week and he did not work out before the Cardinals’ game. Coach Jason Garrett said Romo received treatment on Monday. Garrett said Romo is on a normal timetable for people who have had the same injury. Garrett was asked if he and owner and general manager Jerry Jones are putting pressure on Romo to return when they say the quarterback’s ability to play comes down to pain tolerance. Romo also said last week if it came down to pain tolerance he would play. Without practicing last week, it was clearly about more than pain tolerance. Left guard Ronald Leary did some rehab work Monday after missing the Arizona game with a groin strain. Garrett said the hope is Leary and right tackle Doug Free, who has missed the past three games with a foot injury, will be able to work into team drills this week.